A couple of months ago our barista Torfi won the first Danish Brewers Cup - the competition for black, filter-style coffee as opposed to the espresso-centered Barista Championships. This week the World Brewers Cup takes place at the SCAE show in Maastricht. You can read more about that at SCAE-events.com. On Wednesday June 22nd Torfi will compete and represent Denmark, and of course we hope he'll make the finals on Thursday. 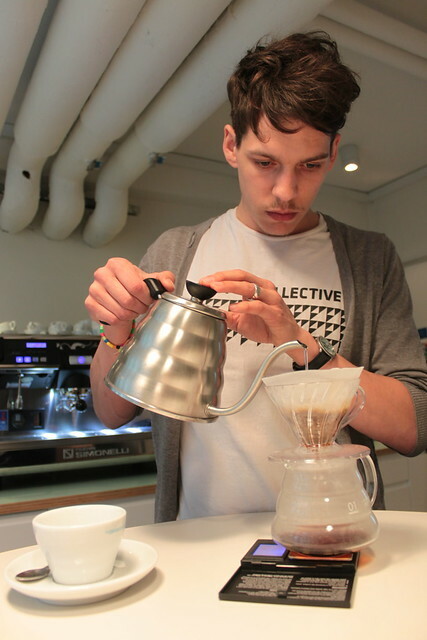 In any case he will be joined by Christian, who placed 2nd in the Danish Barista Championship. Together they'll be brewing up our fresh crop Kenyans, Gichathaini and Kieni, for the good people attending the SCAE show. This will happen at The Village - a new area focused on showing new trends in coffee and some of the new specialty coffee roasteries around Europe. So if you're at the SCAE look for Torfi and Christian and ask for some great fresh coffee. Fantastic! Go Torfi, you sultry minx. Any chance he'll be publishing his recipe's for brewing on the V60? I've been brewing Your Kenyans with mixed results - particularly with the Gichatrihadi (!!?! ), which is causing me grief. I'm having the coffe pre-ground on a semi-coarse setting at your shop (number 7 on the shop R2D2), but when I brew it, it often comes up with a sharp lingering bitterness and a noticable taste of pill coating. I drink (edit: need) it anyway, but it takes me back to childhood illness and being force fed paracetamol fois-gras stylee.. I know I'm solely at fault here because the shop aeropress on the same bean is absurdly sweet and smooth. Please advise?